Who are the stakeholders ? This workshop will take place on July 8-14. First the participants will meet in Zhangjiajie National Forest Park in Hunan Province. Then they will discuss in Hong Kong Polytechnic University. Sustainable tourism is a concept of sustainable development. Its main objective is to offer tourists a quality environment by improving the living standards of the population and respecting the rhythm of the local ecological environment while strengthening the capacity of development of society and economy. Sustainable tourism seeks to promote the positive aspects of the relationship between development, natural environment and social environment and eliminate the negative aspects of this relationship. Solidarity tourism, responsible tourism, green tourism, ethical tourism or ecotourism is a form of sustainable tourism. How can tourism be durable ? What can be done ? What are the main issues ? How to exchange the best practices ? Malcolm is a Cornishman, married with two daughters, and a keen dinghy sailor. He is a Fellow of the Tourism Society, Fellow of the Royal Society for the Encouragement of Arts, Manufacturing and Commerce and a Fellow of the Academy of Food and Wine Service. He is an expert advisor to the European Commission and a member of the EC’s Tourism Sustainability Group and is leading a working group to establish a core set of indicators to measure sustainable tourism. Other appointments include membership of the Forestry Commissions Regional Advisory Board, a Trustee of the Charity that oversees the Fifteen Cornwall Restaurant that helps disadvantaged youth to train to be chefs. Christophe Clivaz (CH): Christophe Clivaz is assistant professor at the Interdisciplinary Teaching and Research unit (UER) in Tourism at the Graduate Institute Kurt Bösch (IUKB) in Sion. He is currently working on the questions of the governance of tourist places and on the analysis of public policies of tourism, at local, regional, national or international levels. From 2000 to 2008, Christophe Clivaz worked as scientific associate then as professor HES in tourism economy and sustainable development at the Institute of Economy and Tourism of the HES-SO Valais in Sierre. His main interests were local agenda 21, sport events, visitors’ management in protected parks and areas and governance of tourist territories. Christophe Clivaz studied political science at the University of Lausanne, has a Diploma in management and analysis of public politics (DESMAP), particularly on environmental management at the Geneva University. He holds a PhD in public administration from the Swiss graduate school of public administration (IDHEAP) in Lausanne. Axel Roduit (CH): Axel Roduit is a communication specialist. Film director, journalist, photographer, he is currently employed by the Foundation for Sustainable Development in Mountain Regions (FDDM), focusing on multimedia illustration of “good practices” in the field of sustainable development. After a master degree in political science at the University of Lausanne, Axel Roduit worked at the Swiss Agency for Development and Cooperation (SDC) at the federal department of foreign affairs (EDA). During his internship, he assisted the head of the knowledge management desk in different tasks concerning knowledge sharing within and between the organizations. In the same time, he attended an in-service education in human rights at the University of Bern. After that, he was trained in journalism and communication at the Swiss Television in Geneva, at the Journalism Training Center of Lausanne (CRFJ) and at the Ecole Supérieure de Journalisme of Montpellier (ESJ, France). Web editing, video production, reporting on many different topics constituted the core of his job during two years. 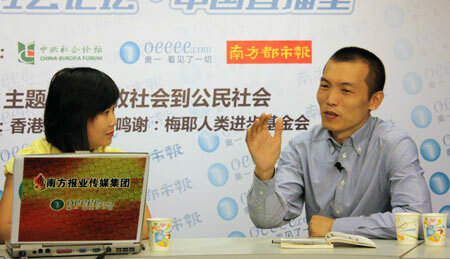 on April, 18, 2009, interview of Professor Chen Xujun for the China-Europa Forum. See the video in Chinese ：Ecotourism, for tomorrow ?